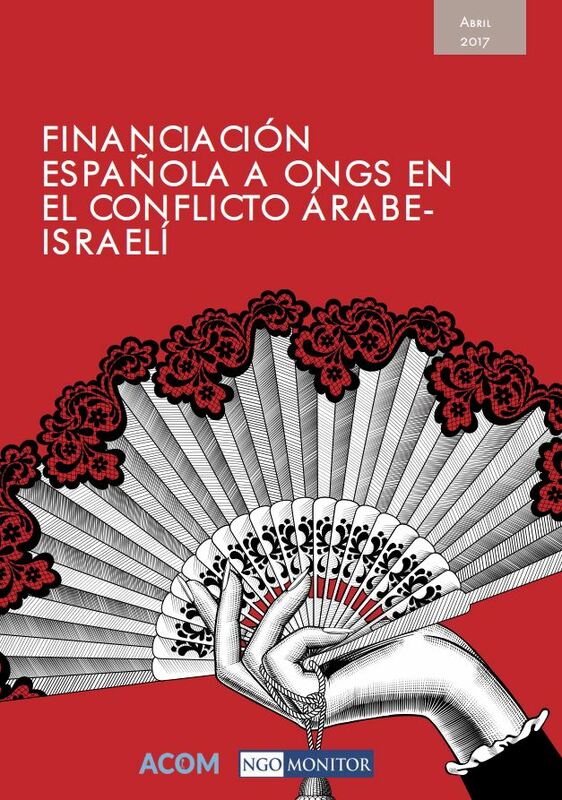 Spanish funding to politicized non-governmental organizations (NGOs) involved in the Arab-Israeli conflict is widespread and highly decentralized, with the phenomenon taking place at several levels of governance in Spain. Funds are managed and allocated by the central government, autonomous communities, provincial deputations, municipalities, and bar associations – reflecting deep political fissures and regional radicalization. 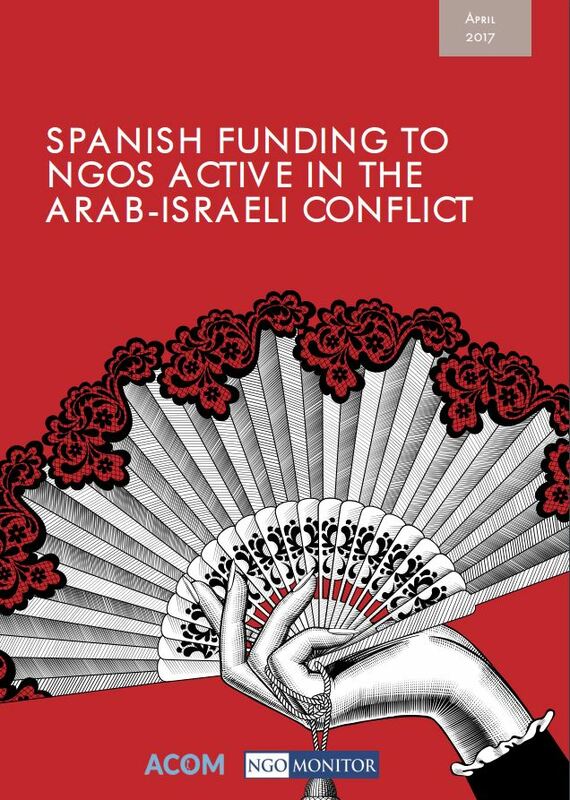 In 2015, Spanish funding to NGOs active in the Arab-Israeli conflict amounted to over €5.1 million. On June 28, 2017, in the Spanish Parliament in Madrid, NGO Monitor and ACOM presented a joint report on Spanish funding. At this event, MK Yair Lapid, Chair of the centrist Yesh Atid party, encouraged his counterparts in Spain to take steps to prevent counterproductive and detrimental government funding. The largest Spanish foreign aid donor is the Agency for International Development Cooperation (AECID), under the Spanish Ministry of Foreign Affairs and Cooperation. According to its charter, the agency was created “to foster full development, conceived as a fundamental human right, with the fight against poverty as part of the process for building this right.” In addition to directly funding various Palestinian and Israeli NGOs, AECID funds a number of projects carried out by Spanish NGOs together with local partners. 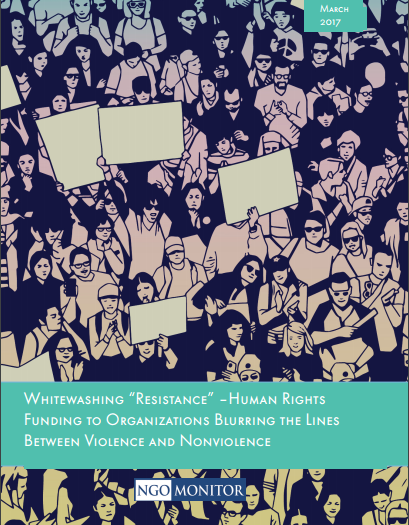 AECID provides funding to Palestinian Center for Human Rights (PCHR), Union of Agricultural Work Committees (UAWC), Union of Palestinian Women’s Committees (UPWC), Bisan Centre for Research and Development, Women’s Center for Legal Aid and Counseling (WCLAC), and the Applied Research Institute Jerusalem (ARIJ). All of these organizations promote BDS and utilize demonizing rhetoric, and as seen below, the first four of these beneficiaries have reported ties to the Popular Front for the Liberation of Palestine (PFLP), a designated terrorist entity by the US, EU, Canada, and Israel. Palestinian Center for Human Rights (PCHR) received €185,581 in 2015. According to a 1995 article in the Washington Report, PCHR director Raji Sourani served “a three-year sentence [1979-1982] imposed by an Israeli court which convicted him of membership in the illegal Popular Front for the Liberation of Palestine…” He was also denied a US entry visa in 2012. Union of Agricultural Work Committees (UAWC) received €184,989 in 2015. Union of Palestinian Women’s Committees (UPWC) received €83,200 in 2015. Bisan Centre for Research and Development received €76,380 in 2015. Women’s Center for Legal Aid and Counseling (WCLAC) received €128,825 in 2015. Manal Tamimi, a WCLAC fieldworker, frequently utilizes antisemitic and violent rhetoric on social media. Applied Research Institute Jerusalem (ARIJ) received €199,611 in 2015. Among the leaders of the political warfare against Israel, seeking to further boycotts, divestment and sanctions (BDS), false accusations of Israeli “apartheid” and “racism,” and support for a Palestinian “right of return” that is inconsistent with two-state solution. Andalucía Agency for International Development Cooperation (AACID) is a primary donor to NGO-led activities in the Arab-Israeli conflict, designating €2,635,330 for such activities in 2014 and €1,279,652 in 2015. 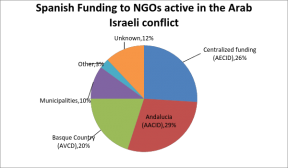 NGO Monitor research into individual grants reveals a higher amount, €1,446,397 in 2015, making AACID the single largest Spanish donor to politicized NGO activities related to the Arab-Israeli conflict. The participation of a governmental development cooperation agency in a radical and discriminatory political activity grossly diverges from AACID’s declared mandate to contribute “to the eradication of poverty and to the consolidation of processes aimed at ensuring sustainable human development,” and attests to severe politicization of Spanish development aid. In 2015, the Al Quds Association was granted a total of €80,000 by AACID, all of which was designated for its “2015 PCHR project” (NGO Monitor translation). In May 2016, the Basque Agency for Development Cooperation (AVCD) signed an agreement to grant Addameer €199,988 to “help Palestinian prisoners.” Addameer is an official “affiliate” of the Popular Front for the Liberation of Palestine (PFLP), designated a terrorist entity by the US, EU, Canada, and Israel. UHWC itself is a PFLP-affiliated health committee active in Gaza, as identified by USAID and in Palestinian documents. Majed Nassar is Deputy Director of the Union of Health Work Committees (UHWC) and has been cited as a PFLP member. According to a 2007 document, Israel has prevented Dr. Majed Nassar from traveling “since 2001,” a decision upheld by the HCJ. PcD coordinator and Cordoba Council member Amparo Pernichi spoke in March 2016 at the “Tree of resistance of the Palestinian People in Cordoba [Andalucía],” invoking classical antisemitic themes: “This has been perfectly organized all along, from the 19th Century, with Theodor Herzl being the first one to talk about Zionism. (…) Another important decision, Balfour, in World War I, he asked the Israelis (sic) that lived throughout the world and that had a lot of money, the richest ones, to help settle the people of Zion in that territory. Those two historical events paved the way for the genocide that happened later. (…) This place is emblematic because we used to gather together here in the recent genocidal episode against Gaza, and I say the recent, because they haven’t stopped killing since then” (NGO Monitor translation, emphasis added). Mundubat is part of the Kanan project, a project dedicated to strengthening “the social and political participation channels of the Palestinian population in East Jerusalem through enhancing the capacity of the youth…” and implemented by six political NGOs, among them Defense for Children International – Palestine (DCI-P), Alternative Information Center (AIC), and Health Work Committees, all of which have ties to the Palestinian Front for the Liberation of Palestine (PFLP) terrorist organization. According to a December 16, 2007 Ha'aretz report, "an investment of hundreds of thousands of dollars, loads of time and countless attempts at intensive Spanish-brokered talks between Israelis and Palestinians went down the drain," when a "peace gathering" scheduled to take place December 14-16 in Madrid The Forum for a Just Peace in the Middle East "collapsed before it could even get started." 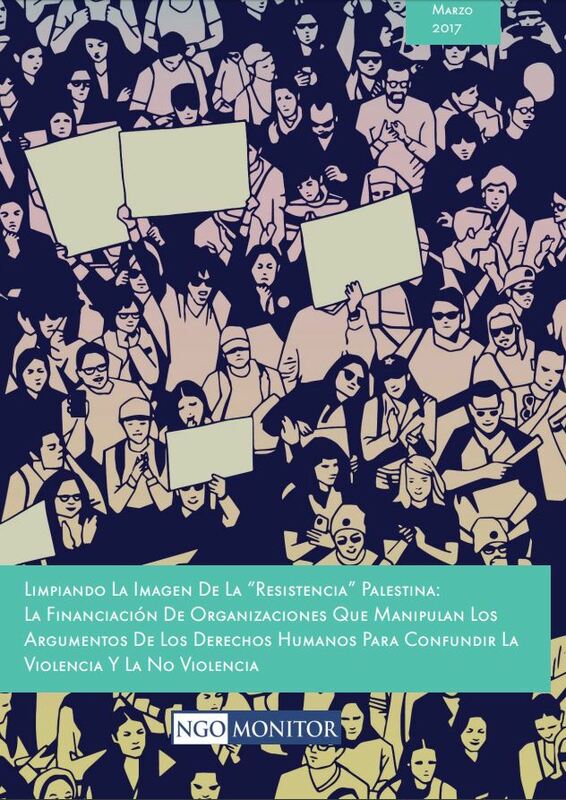 UPDATE: As reported by Palestinian Media Watch, the Spanish government was identified as a sponsor of an ad on PA TV, promoting the boycott of Israeli goods.